The new Parasound Zphono USB is a high-quality phono preamplifier engineered for optimum vinyl LP playback quality. The Zphono USB has precise RIAA equalization and uses high quality parts to achieve extremely low levels of noise and distortion plus accurate frequency response. 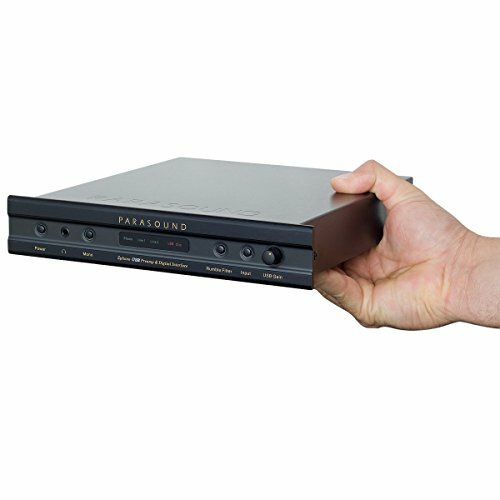 In the digital realm, the Parasound Zphono USB has an A-D converter and USB output to make high quality digital recordings of your vinyl LP collection a snap. Its unique front panel USB gain control and USB clipping indicator enable you to optimize the USB record output level to achieve a superior signal-to-noise ratio with most PC or Mac phono recording software. If you have more sophisticated recording software, the rear-panel RIAA defeat switch allows you to defeat the internal hardware-based RIAA equalization in favor of software-based digital RIAA equalization. Two separate power transformers for analog and digital circuits assure the cleanest response and lowest noise. The Parasound Zphono USB has stereo input jacks for an MC or MM phonograph cartridge. A choice of MM-47 kΩ, MC-47 kΩ or MC-100 Ω enables you to select the ideal gain and impedance for your cartridge. The Zphono USB includes two pairs of stereo line-level input jacks so you can also make digital recordings from other analog sources such as an AM/FM tuner, satellite radio or tape deck. A rumble filter switch and mono/stereo switch can further refine the quality of analog phono listening with older and mono LPs. A headphone jack is provided for easy recording monitoring. View More In Phono Preamps. If you have any questions about this product by Parasound, contact us by completing and submitting the form below. If you are looking for a specif part number, please include it with your message. © 2019 - themettheatre.com. All Rights Reserved.